AAdvantage 30th Anniversary Deal of the Day update: Earn Triple AAdvantage Miles when you Stay at Days Inn hotels between May 24 and July 31, 2011. Go here for details and don’t forget to submit your name in the daily drawing for 30,000 AAdvantage Miles. Back home now after a few days on the road. The weather delayed my return, but after everything that’s happened in Joplin, MO and other cities damaged by this latest outbreak of storms, a delayed or canceled flight seems like hardly an inconvenience. 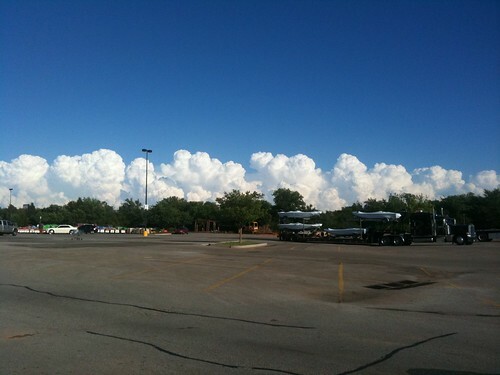 Here’s a photo of the backside of the storm system that eventually moved through Joplin. Not sure that the photo accurately conveys how large those clouds were. I’m from a part of the country where large storms that produce tornados are fairly common, and normally I wouldn’t have taken a photo, but these clouds were so large that I pulled into a parking lot to take this photo and send it to my brother. I told him in the text message that I sent with the photo, that the horizon looked liked some scene from the 1980’s miniseries The Day After. If you would like to join us in supporting the disaster victims by making a cash donation, American will reward your generosity with an AAdvantage bonus mile offer. 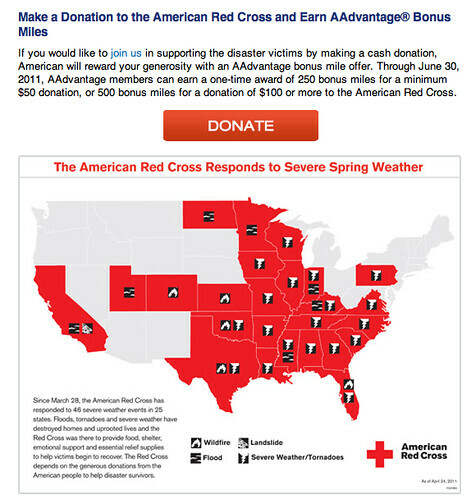 Through June 30, 2011, AAdvantage members can earn a one-time award of 250 bonus miles for a minimum $50 donation, or 500 bonus miles for a donation of $100 or more to the American Red Cross. Go here to learn more or to make a donation.